Really nice staff! They made sure that everyone felt at home. Nice pool as well en the food also tasted good! Would really recommend the hostel if you are looking for a place to meet people and go to party’s. Really enjoyed my stay here at arena! Good service behind the bar and the reception. During our stay Jane helped us alot with al out question and gave us lots of tips for the island. Besides the service the rooms were very clean and comfy. They are really helpfull. And the accommodation is perfect! We really liked our stay in the Phangan Arena! That’s why we stayed there 2 times during our trip trough Thailand. There’s a really good atmosphere. The food and drinks are good and good prices. And we liked it that there’s a swimming pool. The rooms are clean and the facilities are good. Also the location is good. We will definitely come back if we are again in Koh Phangan. It was one of the best hostels we stayed in thailand! 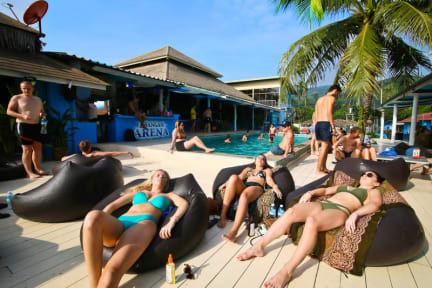 Best place to stay in Koh Pahngan! Great staff and good atmosphere. Very nice if you want to meet other people and have a party! Hostel was clean and has many facilities as well. I would definitely stay again! We loved staying here because it is an easy place to meet people, we enjoyed the relax and party places a lot. The people who work there are very nice and helping. The rooms had lots of space and the beds slept really good. The hostel is very clean eventhough there is a lot of partying going on. The facilities were al we needed. We where there when it was calm but even then we had a good time at the hostel. The bar is open for 24/7. Super chill hostel!! Heel veel feesten, dat wel, maar als je daarvoor inbent zeker een aanrader! Personeel is heel lief, ik was mijn paspoort vergeten en ze hebben er alles aangedaan om die optijd naar mij te brengen, voordat mijn boot vertrok! The hostel on itself was really cool and really big, there were a lot of people when I was there. I felt like the room wasn’t very clean and the bathroom didn’t get cleaned once while I was there. Also, during high season the room rates are extremely high. I don’t feel like I got my money’s worth, as the hostel is very far away from the parties in Haad Rin too. The 24/7 restaurant is a plus and the great atmosphere made up for it though. Would recommend in low season! Great party hostel but thats all it is. Dirty rooms, small pool and the beach nearby is just a dump. Especially the ensuite rooms are really small. 10 min cab ride at least to full moon so it's not as closeby.